Uglyworld #728 - Ice-Bat's Frozen Snack (231-365), originally uploaded by www.bazpics.com. This evening I had to not only work a little late but also head out with some of the customers, so by the time I got home the little guys were all starving. 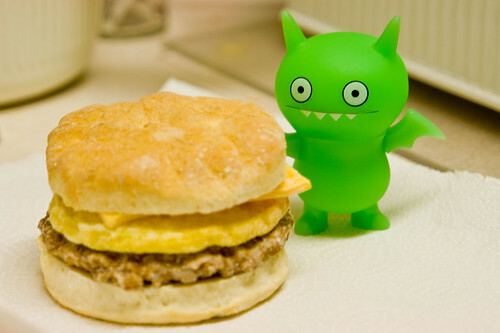 Babo suggested that I fire some of the Sausage, Egg and Cheese biscuits into the microwave for their late evening dinner, but Ice-Bat couldn't wait for his to be heated up and decided to munch it in it's frozen state straight out of the freezer.